I would repeat what Dan and Halfling have said. Thank you everyone for your commitment to play your game with me. Special thanks to those who play late night, specially Dan and Halfling this time (and many others in previous leagues/cups), as time different and work prevents from starting the game earlier in the day. Commiserations to Chuck at the bottom, but one thing I've learnt in this league is that the Tower is truly unpredictable and I know from how well he played in our game that he will put up an equally good fight in the next round! Thanks, Dan. And thanks to the others in this group. 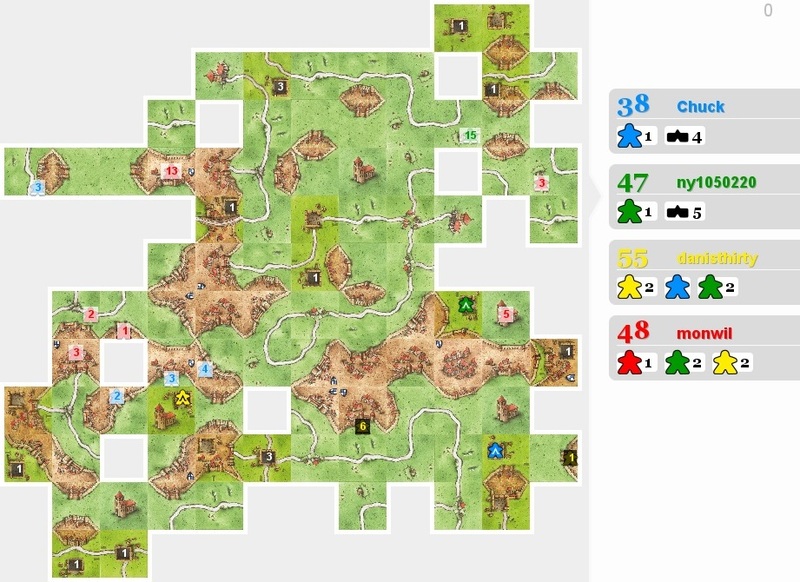 In this league or any other league it depends much on the tile distribution, how to play. I was in defensive mode in this and the game against ny; vs. Halfling, I was lucky with tile drawing and against Dan it was almost even. Now, I'm waiting for my last three games in this league and I am curious who it will be! Although it was a very tough game for all of us, it wasn't quite as chaotic as I'd been expecting despite everything that was happening. monwil and I were definitely much more eager to capture than ny1050220 and Chuck, but I certainly had my fair share of meeples captured too! In the end it was a 32-point city that won it for me, and this was purely down to good luck as there was only 1 cccf left in the deck and I was the one who drew it. This single tile was worth 31 points to me, plus 6 more for the farmer I placed. Crazy. However, I was the first to place farmers on either of the more valuable farms and in both cases they got kidnapped so I still felt it was a moral victory! Thanks for the game everyone!